A picturesque village at the foot of the Curlew Mountains it lies on the shore of Lough Arrow. There is a small castle of the Curlieus which can be found in the village. One of the few limestone lakes in Connaught, measuring 3,123 acres, Lough Arrow contains four main islands named Anaghgonda, Inismore, Inisbeg, and Much Island. He maintained an active political role in Irish History, as the only Catholic in an influential position when the Penal Laws were introduced to reinforce Protestant ascendancy in Ireland.He practiced law until 1692 and helped many families , such as the O`Connors and O`Rourkes to hold onto their hereditary possessions and lands. The Abbey contains a church with a central tower and a belfry overlooking the lake.The central tower has six arched openings to the nave, the two central of which open to the chancel.The upper storey may be reached by a hazardous stone stairway on the outer wall, leading to the gallery with a high central arch where a crucifix may have been suspended .The tower may have been living accommodation at one time; there is also an interesting stone carved rose on this floor. Despite continued persecution, under English rule, the Dominicans remained in the area for centuries.Friars lived in isolation on the bog in a ruined cabin 2 miles west of the abbey and only used the abbey for Mass, even during the troubled Penal days , so committed were they to their faith.The Abbey was granted to the King family of Boyle and Rockingham in 1660. One of the largest and most ancient monuments in Ireland, this ‘Heap of Stones’ measures 63 metres diameter and dates back to 3,000-1,700 A.D. It is thought to be a passage grave, perhaps the grave of Ailill, the son of Eochaid Mugmedon and the brother of ‘Niall of the Nine Hostages’, both of whom were high Kings of Ireland. This tomb remains unexcavated, although many stones have been removed from the mound. This lake gets its name from Irish mythology, the word ‘suil’meaning eye. Balor of the Evil Eye, a Formorian warrior, was killed during the Battle of Moytura when a stone cast by the enemy, Tuatha, took the eye out of his head and landed nearby forming a crater. Being a gigantic race this crater was such a size that it filled with water and formed this lake. This tomb is 44 feet long and 9 feet wide,thought to be stone age dated at around 2,500 B.C.Widely known as the giants grave it is divided into four parts by cross stones. 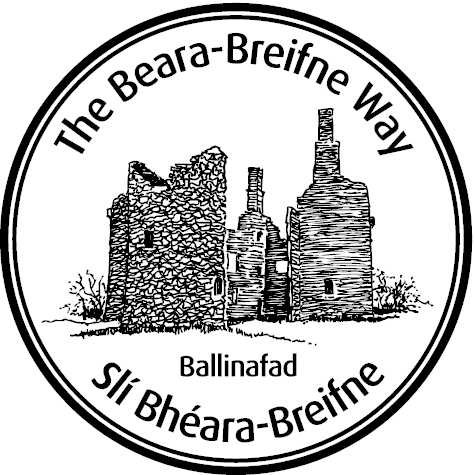 Ballinafad is part of the ancestral home of the McDermott, O’Donnell and O’Rourke and forms a stage of the Beara-Breifne Way which is based on the historic march of O’Sullivan Beara in 1603.